Despite the advances in the pharmacological treatment with the introduction to the market of new biological agents, a significant proportion of patients with inflammatory bowel disease (IBD) still suffer an aggressive disease course. Moreover, surgery is not always a viable option due to the location or extent of the disease, particularly in complicated Crohn’s disease patients (e.g., in the presence of fistulas). Lately, stem cell (SC)-based therapy, mainly comprising hematopoietic SCs (HSCs) and mesenchymal SCs (MSCs), has been proposed as an alternative approach to biological agents for IBD treatment. The rapid advances that occurred in MSC research, known to exhibit regenerative, paracrine, and immunoregulatory properties, have raised hope for their therapeutic potential in IBD, especially after the recent official approval of darvadstrocel, the first allogeneic MSC therapy in Europe. 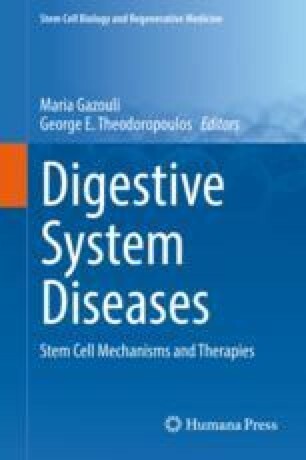 In this chapter, the pathophysiology of gastrointestinal SCs and all the latest literature concerning their use in IBD treatment are discussed, mainly focusing on the latest clinical trials in IBD patients. Finally, safety of HSC- and MSC-based therapies are discussed, and insight is provided for the questions needed to be answered by future studies. Press release. TiGenix and Takeda announce Alofisel® (darvadstrocel) receives approval to treat complex perianal fistulas in Crohn’s disease in Europe. 2018 Mar 23. Available at: http://tigenix.com/wp-content/uploads/2018/03/20180323-TiGenix-Takeda-EC-approval-PR-ENG-FINAL-clean.pdf.